Palmer Engineering prepared a feasibility study to determine the cost and viability of implementing improvements proposed by a group of neighborhood residents for the intersection of Euclid Avenue, Fontaine Street, and High Street. The intersection serves many businesses but also contains both commercial and city parking and has a high level of pedestrian and bicycle activity. The neighborhood group proposed reducing the pavement area, where possible, increasing parking spaces, and adding bicycle lanes on all of the adjacent routes. 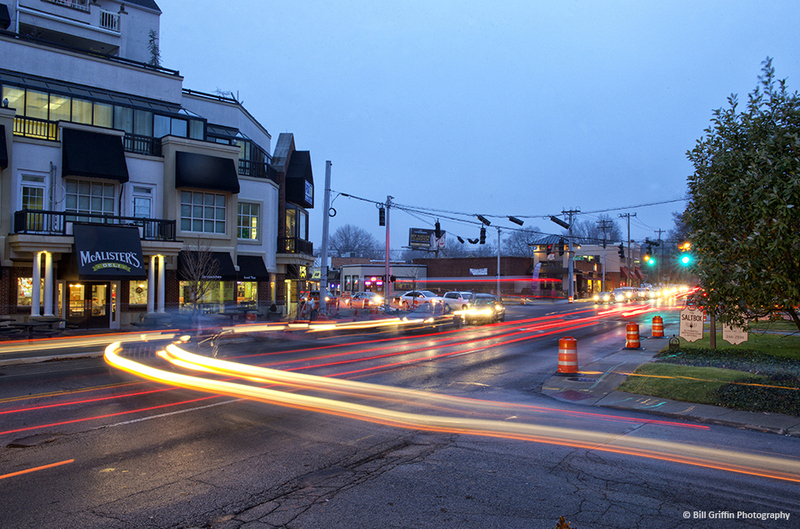 This intersection also is in close proximity to the University of Kentucky campus, and apartment buildings and rental property are home to UK students. Traffic forecasts were prepared based on a combination of city counts and Palmer Engineering-performed counts. A VISSIM traffic simulation was developed, and recommendations were made indicating where turn lanes needed to be extended or could be reduced and still manage the design year traffic flows. The addition of greenspace was a goal of the project with compression of the intersection reducing unused pavement areas. A roundabout configuration was discussed but discounted because of right-of-way and maintenance of traffic considerations. This goal also provided the benefit of shortening pedestrian crossing lengths. Streetscape improvements were examined to incorporate green technologies and potentially urban art. Back-in parking was also considered as a method to increase the number of available parking spaces and provide safety benefits over the existing parallel parking. An initial public meeting was held to present three potential alternative schemes of improvements with a variety of median access management methodologies. With input from that meeting, a final preferred alternative was developed for presentation at the final public meeting. Two meetings were held with the general public, and one meeting was held with local business. Additionally, meetings have been held with stakeholders and utility companies for additional input. Grant applications will be prepared by the City of Lexington to fund future phases. The project has received local funding to complete the initial phase of work consisting of repaving, restriping, modifying signals, and reducing the footprint of the intersection. Palmer Engineering has been coordinating with KYTC and utility companies and is near completion of the design.